North Korea began a live-fire drill near the tensely guarded western border on Monday, hours after notifying the South of its planned drills in a rare move by the communist state, the Joint Chiefs of Staff said. The North fired several artillery shells in waters north of the Northern Limit Line in the Yellow Sea starting from 12:15 p.m., the JCS said. 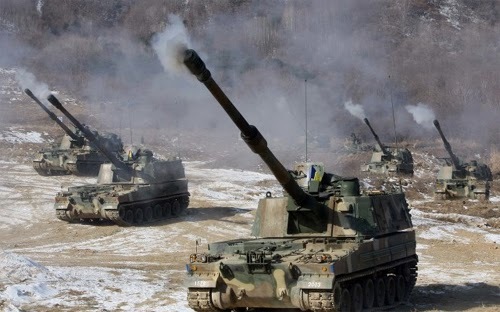 After several rounds of the shells fell south of the NLL, the South Korean military shot dozens of artillery shells with K-9 self-propelled howitzers in response and dispatched F-15K fighter jets near the maritime border. Residents in the northernmost island of Baengnyeong were evacuated to temporary shelters, military officials said. The move came after the Southwestern Command of the Korean People's Army faxed South Korean Navy's Second Fleet at 8:00 a.m. to announce the fire drills in seven border regions near the western maritime border later in the day. "North Korea demanded South Korea control its vessels in seven regions north of the NLL before it holds the live-fire drills," the JCS said. "We have banned vessels from entering the training zone for the safety of residents and sailors." It is rare that the communist state announces a training zone that encompasses all western border regions ahead a live-fire exercise. The South Korean military has stepped up its guard against possible clashes, looking into Pyongyang's intention behind the latest provocations. "We consider that the North's announcement contains hostile intentions," Army Col. Wi Wong-seop, the vice defense ministry spokesman, said in a morning briefing ahead of the drill. "(North Korea) is believed to be creating a crisis situation on the Korean Peninsula by raising tensions near the western maritime border." Seoul officials have been on high alert as some artillery shells fired by the North fell south of the NLL during a 2010 exercise. The latest move comes as the North Korean military has been stepping up its rhetoric against annual joint drills between South Korea and the United States, firing a series of missiles and rockets in a show of force in recent weeks.